Jim Goodson, M.P.H. 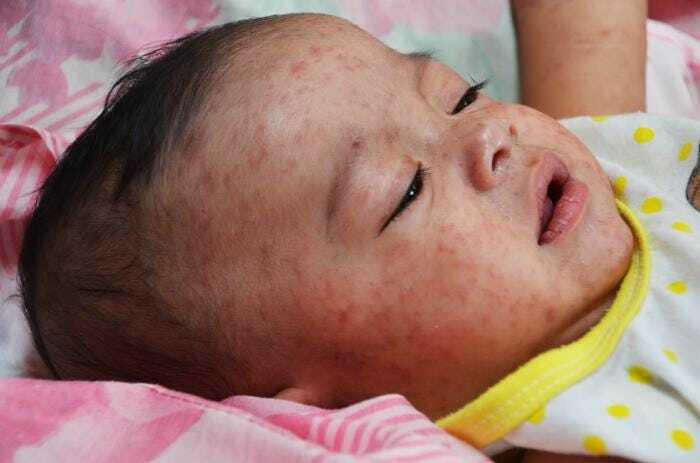 / CDCA baby with measles in hospital in Manila, the Philippines, in early 2014. We always fear the wrong things. We worry about dying in a plane crash, not a car accident — even though the latter is a far greater risk. So it goes with diseases, where Americans tend to fear distant new threats, like Ebola, and ignore the bogeymen so much likelier to get us: heart disease, diabetes, the flu. Those with the luxury of doing so have stopped being afraid of the illnesses we no longer see, the diseases that were painful, fatal, and widely feared before vaccines stepped in to protect us with almost miraculous efficiency. Perhaps the most striking example of this is measles, an entirely preventable disease that is making an alarming comeback in the US. This year, the Centres for Disease Control and Prevention has documented 603 cases of measles spread out across 22 states — the highest case count since 1994. There are two reasons for this year’s measles resurgence in the US, according to a recent paper in the New England Journal of Medicine. The first is that the virus is still rampant in other countries, where it remains a leading cause of death in children. Globally, more than 20 million people still get measles each year; about 122,000 of them die. Americans who travel can’t completely avoid contact with measles in many countries, but with high vaccination rates and effective infection control procedures in place, the disease can be kept at bay in the US. Omer et. 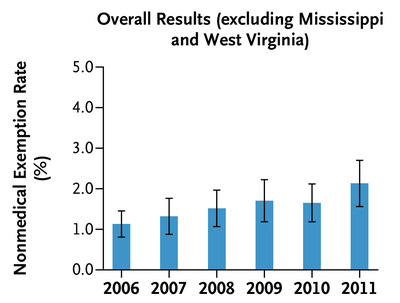 al., NEJMMississippi and West Virginia are excluded because they don’t allow non-medical exemptions. That upward creep seems small and insignificant, but looking at the overall rate of exemption obscures the real danger areas. The problem is that those who who have “philosophical” objections to vaccination, generally based on fear and misinformation, are often clustered in communities of like-minded people, significantly raising the risk that a single case will spiral into a larger outbreak. In dozens of New York City private schools, for example, the vaccination rate is below 70% — worse than in developing nations like Afghanistan and Liberia. In Los Angeles, the “percentage of kindergartens in which at least 8% of students are not fully vaccinated because of personal beliefs has more than doubled” in seven years, the Los Angeles Times reported. Herd immunity against measles requires a vaccination rate of 92% or higher, so when at least 8% of a population is unvaccinated, the vulnerable are no longer protected. 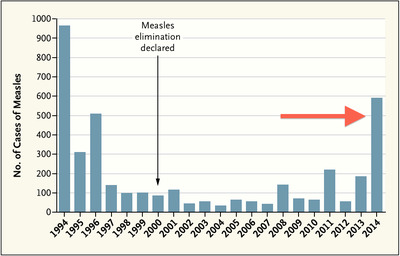 For most people in this country, measles seems like a historical artifact, not a current threat. But not so very long ago, almost every single American got measles by the time they turned 15. The first known description of the disease appeared in the ninth century, but even by the 1950s in the US, approximately 4 million people were infected each year and 48,000 ended up in the hospital with measles-related complications like pneumonia. While the most common symptoms are a fever and a rash, the most-feared side effect of measles is encephalitis, a brain swelling that occurred in thousands of children every year and often led to deafness, cognitive delays, and lasting neurological problems. While measles deaths in the US peaked in 1923, when there were 10,000 in a single year, by the 1950s, the highly contagious disease was still killing about 450 people each year — mostly children. 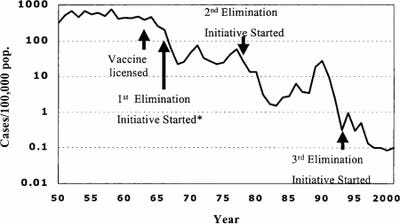 Then, in 1963, the first measles vaccines were approved. The Associated Press called them “a landmark in preventative medicine.” The Surgeon General at the time said the US could eliminate the virus within two years. 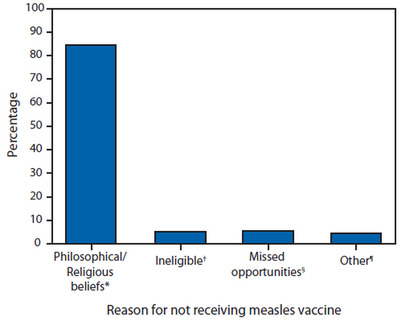 But measles was not so easily defeated. 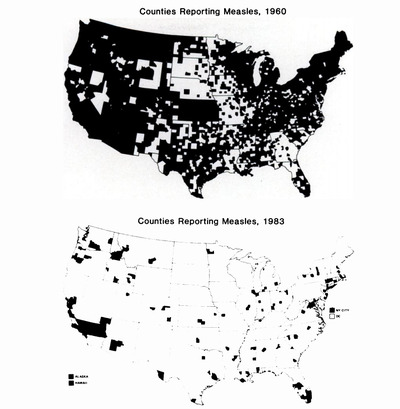 The first two pushes to completely end the transmission of measles in the US happened in 1966 and 1978. 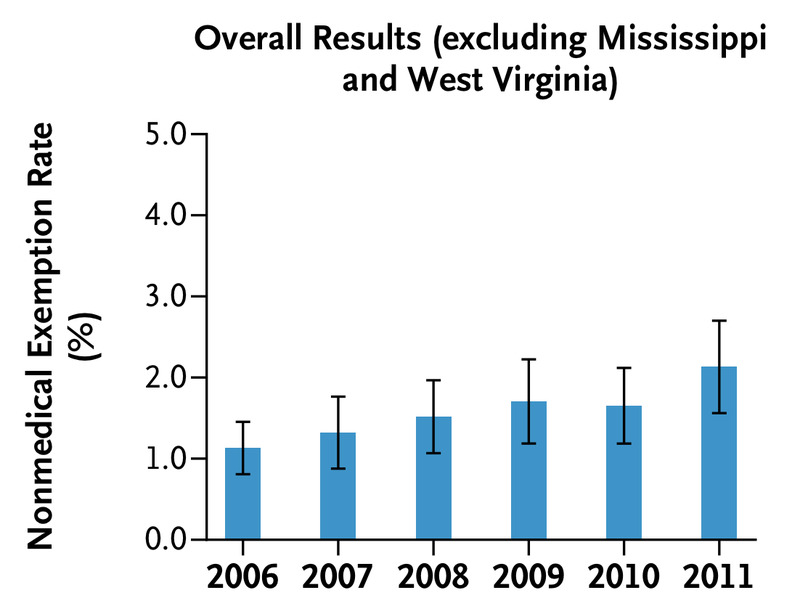 Both efforts led to steep drops in infection rates, but with gaps in vaccination, the disease surged again, with 55,000 cases and over 11,000 hospitalizations in 1989-1991. Finally, with lessons learned from the first two failed attempts, a third elimination campaign was launched in 1993. It was a stunning success. By the year 2000, travelling Americans still acquired measles abroad and carried it home, but the disease had been declared eliminated in the United States. In 2004, CDC scientists celebrated the success of the measles vaccination program in a special issue of The Journal of Infectious Disease. Orenstein & Seib, The New England Journal of MedicineChart shows measles cases as of August 29, 2014; as of November 1, there have been 603 cases this year. CDCPercentage of US residents with measles who were unvaccinated (N = 195), by reason for not receiving measles vaccine (January 1 — May 23, 2014). Today, somewhat hypocritically, parents in the US who refuse vaccinations rely on generally high inoculation rates to protect their own children, who they have made vulnerable by choice. 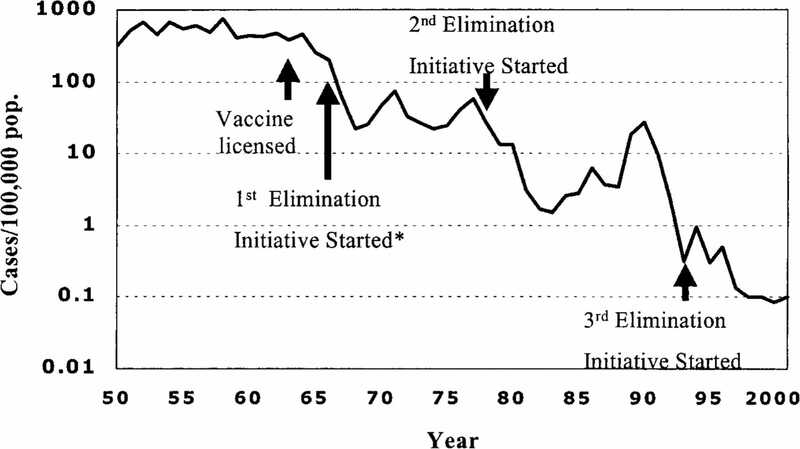 But as the number of vaccine exemptions ticks up, that strategy is increasingly likely to backfire. Measles is one of the most contagious diseases humanity has ever seen. While each case of Ebola, for example, leads to about 1-2 additional cases, a single case of measles can cause up to 18 secondary infections. “Almost everyone who has not had [the] vaccine will get measles if they are exposed to the measles virus,” the CDC warns. Ten years later, it seems we’ve all but forgotten those lessons. “One of the problems that [I’ve had] is to get people to understand that the absence of disease does not mean absence of the risk of disease,” says Walter Orenstein, the associate director of the Emory Vaccine Center and a coauthor of the recent New England Journal of Medicine paper, in an interview with the New England Journal Of Medicine. When people see more measles around them, it tends to spark higher vaccination rates, but “we don’t want to wait for an outbreak,” Orenstein notes. By then, children and babies will have already suffered needlessly in a country where most people are lucky enough to have easy access to vaccines, and a growing minority are foolish and hubristic enough to refuse them.